Airguide Publications is proud to offer a powerful application for Apple’s revolutionary iPad—Flight Guide iEFB. Special Data Plans are available for both VFR & IFR pilots. Our VFR Standard Data Plan includes all of our high quality airport & supplementary information, nearly 5000airport diagrams, Fuel Prices, Class B, C & selected D Airspace Charts, On & Off field info as well as all the pertinent information that has made Flight Guide a staple in GA for over 50 years! Additionally, this plan provides Flight Planning and Moving Map capability on our Seamless WAC & Sectionals (Using any iPad compatible GPS device) and includes Terminal Area Charts (TACs) to satisfy FAA requirements. Individual non-seamless sectional charts, which include the “panel” information, are also available. Current NOTAMs, METAR/ TAF & Wind info is available for each airport. The VFR Standard Data Plan provides updates for the lower 48 states. Textual data for each airport can be updated and stored daily on your iPad’s hard drive using Flight Guide iEFB’s “On-The- Fly” auto update feature! For even more situational awareness, the VFR Plus Data Plan additionally includes geo-referenced Flight Guide airport diagrams for real-time aircraft positioning. Our IFR Standard Data Plan contains everything the VFR Standard Data Plan provides with the addition of IAPs, DPs, STARs, Take-Off, Radar and Alternate Minimums, IFR Seamless and Non- Seamless Low & High Enroute charts with expanded chart coverage for Alaska, Hawaii and the Caribbean. The IFR Plus Data Plan additionally includes Flight Guide’s nearly 5000 geo-referenced airport diagrams and geo-referenced IAPs for real-time aircraft positioning. All charts, IAP’s & Flight Guide’s nearly 5000 airport diagrams are geo-referenced for “Moving Map” capability using any iPad compatible GPS device including Flight Guide’s FLY-Wi GPS. All charts, plates and airport diagrams can be zoomed in or out using Apple’s standard “pan, pinch & drag” interface. Hyper-linked airports on any chart will instantly bring up that airport’s IAPs and IFR data as well as all Flight Guide trusted airport information. This would include: airport diagrams (with taxiways identified & right-hand traffic pattern depicted), Class B, C & selected D airspace graphics, frequencies (navigation & communication), flight operational information, FBOs (services, location & contact information), current & nearby fuel prices, food, transportation, lodging and recreational information. In turn, the airport information page contains a link back to that airport’s location on all VFR and IFR charts. With an internet connection, METAR/TAF & Winds are available on the airport information page. With Flight Guide iEFB, lugging around heavy and costly paper charts is a thing of the past. Lighten your load and enjoy the savings with Flight Guide iEFB for the Apple iPad. Flight Guide iEFB is the easiest way to stay FAA compliant, with thousands of airports and charts, in one amazing device. The Flight Guide iEFB App is availableFREE through the Apple App Store. Monthly Data Plans range from $9.99 to $19.99 per month and are purchased only through the Flight Guide iEFB App itself on your iPad. Annual Data Plans give you the added value of paying for only 10 months and receiving 2 MONTHS FREE! Annual data plans are purchased only through the flightguide.comwebsite. The Flight Guide FLY-Wi GPS incorporates an aviation grade WAAS GPS that communicates wirelessly with the iPad via WiFi. This enables the Moving Map feature in Flight Guide iEFB to display your position on all Sectionals, TACs & IFR Enroute Charts during flight. In addition,Flight Guide iEFB Plus Plan subscribers can view their aircraft position on all IFR Instrument Approaches and Flight Guide’s nearly 5000 geo-referenced airport diagrams! This wireless connection allows for iPad mobility in the cockpit! The FLY-Wi GPS will allow you to connect up to 4 separate iPads running Flight Guide iEFB by using its “Multi-Point” network capability! This allows you as pilot, your right seat and passengers to track your location during a flight. Multiple data display options are possible when using the FLY-Wi GPS and Flight Guide iEFB. Click here for list of display options. As an added bonus, the Flight Guide FLY-Wi GPS includes a second input that with future updates to Flight Guide iEFB will give pilots the option of integrating the ZAON PCAS XRX for in-flight traffic (v4.0) or by connecting an XM orADS-B receiver for in-flight weather (v5.0) to display on Flight Guide iEFB’s seamless charts! Flight Guide FLY-Wi GPS consists of two components: the FLY-Wi wireless transmitter (about the size of an iPhone) and the GPS (about 2” in diameter). Flight Guide FLY-Wi GPS has a rechargeable battery life of up to 10 hours and comes with a standard 110-volt wall charger. For Jeppesen customers with a JeppView or NavSuite subscription, you can now access your departure and arrival procedures, approach charts and airport diagrams directly on your iPad. The Jeppesen iPad flight chart app is available as a free download from iTunes. 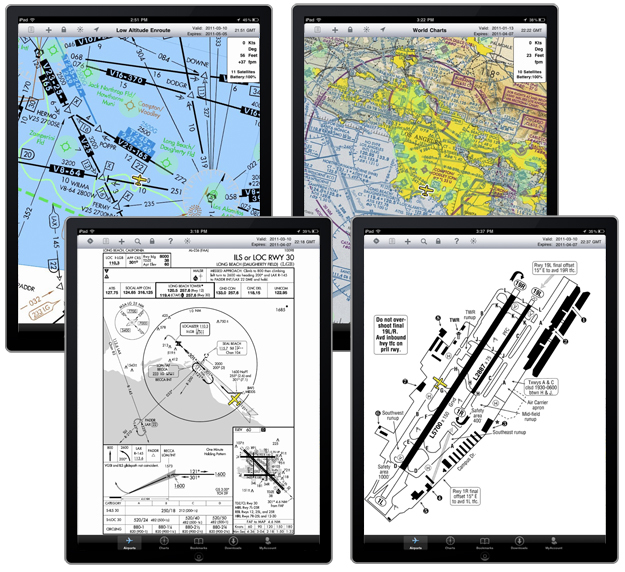 Note: If you have a Jeppesen data subscription for your airplane, you get an additional four licenses to use on your computers or iPad at no additional charge. This is the only app available that will allow you to view Jeppesen charts and approach plates. Jeppesen provides enhanced full color, high-quality vector-based electronic approach charts and airport diagrams. The government charts are significantly enhanced to provide information in an easier to use format. This app does not use positional referencing so you will not see your position on these charts.